The black-capped conure is one of the smallest of the conure parrots, and is one of the most distinctive in appearance, with its brownish-black crown and scale-patterned neck. It can be a slightly shy bird, but once comfortable with its family, the black-capped conure is an inquisitive and loving pet. It has the notable advantage of being a quieter species than the other conures. The black-capped conure is also known as the rock parakeet, the black-capped parakeet, the rock parakeet, or Sandia conure. Pyrrhura rupicola rupicola, native to central Peru. This is the nominal species that is usually sold as a pet. The black-capped conures native to areas of South America including Peru, Bolivia, and southwestern Brazil. It lives in humid forest ranging from the Amazonian lowlands up the slopes of the eastern Andes to an altitude of about 6,000 feet. Because much of this bird's native habitat is being disturbed, it is designated as a Near Threatened species. Black-capped conures are the smallest of the conure species, with adults reaching a length of 9 to 10 inches from the beak to the tip of the tail feathers. Adults weigh only about 2.5 ounces. Properly cared for, black-capped conures can live for up to 30 years in captivity. Known as friendly, easy-going birds, black-capped conures are highly social and highly trainable pets. They enjoy interacting with their owners, and they crave daily playtime and attention. They will become very friendly with family members but can remain a bit shy with strangers. They do best in a household that is active and bustling, as the activity keeps them interested and stimulated. Those who would like to own a black-capped conure should make sure that they have plenty of time to socialize and interact with their new pet. A lonely black-capped conure can become depressed and develop both medical and behavioral problems as a result. The black-capped conure is a mostly green bird with an unusual brown-black cap and whitish scale pattern on the neck and breast. It has touches of red along the leading edge of the upper wing coverts. The green abdomen is tinged with bluish marking, and the tail feathers have dark gray undersides. The feet, legs, and beak are gray. Males and females are identical in coloring. One mutation of this species, called the yellow-sided black-capped conure, has yellow shading on the sides of the head and neck. It's always worth checking with animal rescue organizations and animal adoption agencies if you are interested in owning a black-capped conure; occasionally birds are abandoned by owners unable to provide for their needs. Otherwise, you will likely need to seek a breeder in order to obtain a bird, as black-capped conures are not commonly sold in pet stores. A black-capped conure needs a cage large enough to provide space for daily exercise—the smallest cage acceptable is one with an 18-inch footprint, 24 inches in height. This assumes your bird will get several hours of out-of-cage time for flying and playing. Where this is not possible, the bird should have a larger cage that provides enough space for legitimate flying and exercise. Provide sturdy perches within the cage, as well as plenty of chew toys. Changing these frequently will keep the bird curious and stimulated. These are intelligent birds that easily grow bored without stimulation. Also, make sure there is an out-of-cage play apparatus (a playpen) for the bird to use during its out-of-cage exercise periods. 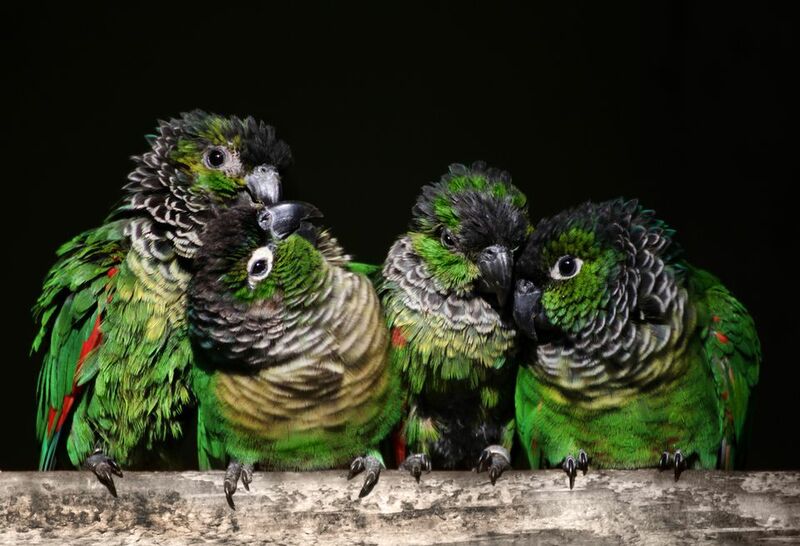 Like all parrots, black-capped conures are flock birds and will need a considerable amount of social interaction with human caregivers in order to stay happy and healthy. In nature, black-capped conures form flocks of about 30 birds, and in captivity, they will do best in an environment with a lot of noise and activity. Be prepared to give your conure 2 to 4 hours of out-of-cage time for exercise and interaction, and make sure to supervise this time, as this inquisitive bird can easily get into trouble if not watched. Black-capped conures make beautiful, intelligent, and fun-loving pets for the right people. While they do require a great deal of attention from their owners, they always seem to reward human efforts with their hilarious antics. But even hand-raised parrots can reject human interaction if neglected, and the same holds true for black capped-conures. While not famous as talkers, a black-capped conure can learn a few words and phrases for owners who spend the time coaching them. Like all parrots, black-capped conures thrive on a varied diet that includes fresh fruits and vegetables, a high-quality seed mix, and a quality commercial pelleted diet. All conures are active birds, and this is especially true of the black-capped conure. Your pet will need at least 2 hours of out-of-cage time each day in a safe, supervised play area. Make sure your pet has a variety of chew toys, which will both exercise its jaw muscles and provide it with mental stimulation. Several perches of different diameters will help keep your parrot's feet limber. The conures, in general, are among the hardier of parrot species, and many owners may never experience a serious health problem. But like other conures, the black-capped conure can be prone to feather picking, which is usually a sign the bird is bored and in need of more attention and stimulation. Infrequently, a conure may suffer from proventricular dilatation disease (PDD), psittacine beak and feather disease, psittacosis bacterial infection, beak malocclusion, or aspergillosis fungal infection. Have an avian veterinarian check your bird regularly to spot these problems in the early phases. Otherwise, check out of bird species profiles of other parrots.